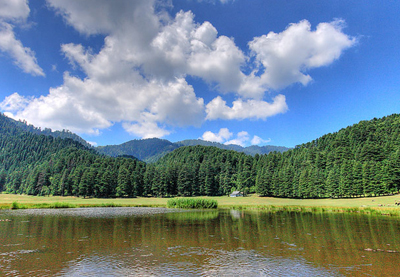 Surrounded by cedar forest, Khajjiar Lake is one of the most popular tourist spots of Khajjiar. Located at a height of 1,920 meters, the shimmering lake gets its source from the small water streams of the Himalayas. The main attraction is the floating island in the lake, which is nothing but a cluster of grass and weeds growing on the surface of the lake. You can also enjoy a spectacular view of Mount Kailash from this place. Spread over 30.69 sq. Km., the Kalatop Khajjiar Sanctuary is in the Chamba District of Himachal Pradesh. Located 6km. 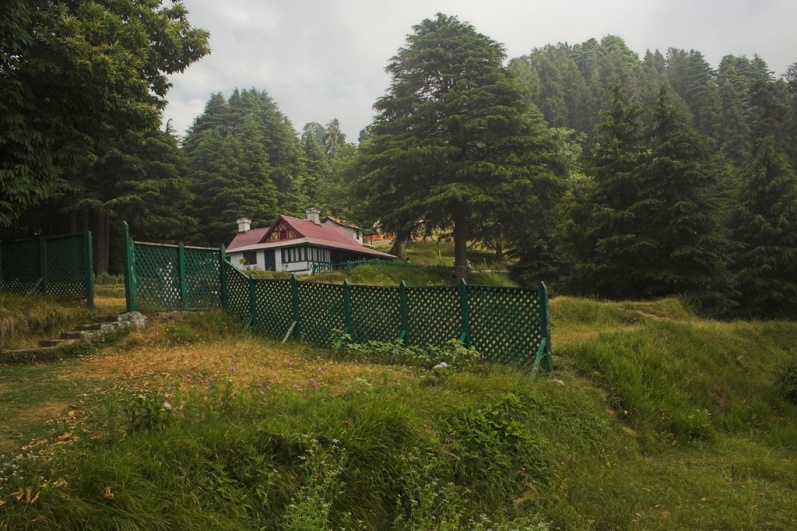 from Dalhousie, the sanctuary offers a perfect route for trekking, hiking, and jeep safari to explore wildlife. The sanctuary lies in the path of river Ravi. While deodar, pine, oak, rhododendron dominate the flora of the region, the sanctuary has a wide range of animal species including Himalayan Black Marten, Bear, Leopard, Barking Goral, Serow, Tahr etc. Situated in a close proximity to the famous Khajjiar Lake, the famous Khajji Naga Temple dates back to the 12th century AD. Dedicated to the lord of serpents—Khajji Naga, the temple has numerous idols of snakes. You can spot the images of five Pandavas in the corners of the Mandapam— Yudhishthir, Bhim, Arjun, Nakul, and Sahdev made of wood strand. The temple also boasts idols of Lord Shiva and Goddess Hadimba. With artistic wooden posts and wooden carvings on the ceilings, the temple serves as a perfect blend of Hindu and Mughal architectural styles. Situated on the edge of Khajjiar Lake, the scenic beauty of the temple attracts a lot of devotees and tourists. The temple gets its name because of its golden dome and spire. Close to the temple, there is a golf course that has a panoramic surrounding. Built in 2008, the 85 feet-high Lord Shiva Statue is one of the tallest statues in Himachal Pradesh. The statue is about 1 km. behind from Khajjiar on the Chamba Road. Polished with bronze solution, the glistening statue is a sight to behold. The nearby temple holds a function during the month of June-July. During the winter months, the statue looks more majestic when covered with snow. Apart from this, Khajjiar has many small picturesque villages including Rota, Ladi etc. known for their apple orchards. Browse through the best Himachal tour packages, head to Khajjiar and soak in the splendid beauty of this natural paradise.